Walking around the Spanish countryside in winter one can often hear the clacking of sticks and the noise from what sounds like motorized saws (they are actually branch shakers). 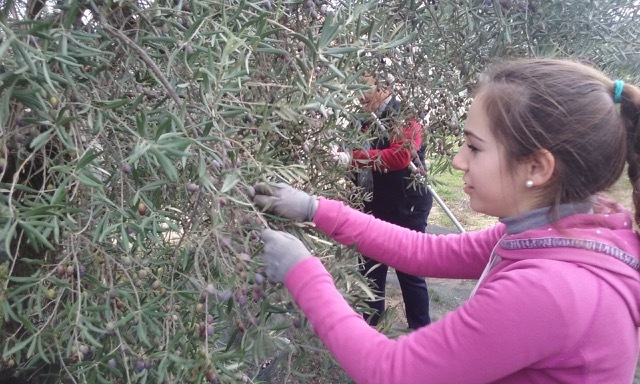 The olive trees are heavy with fruit, threatening to fall to the ground and the cooler days and low December sun makes perfect weather for picking. It is olive harvest time in Andalucía. Actually, I should correct myself, as olives are harvested from November to March, depending on the area, types of grapes, and last but not least, whether one has enough help. Like any harvest, picking olives is a race against time, before rain, wind, hail or drought comes to ruin the entire crop. Yet, olives are tough, thriving in poor, dry or rocky soil. They need very little water. You can crop them down to the ground and they will still come back. They can handle sub-zero temperatures, as well as scalding near 50-degree-Celcius. They yield fruit year after year and are to my knowledge the only sadomasochistic tree around, accepting a thorough beating every harvest. 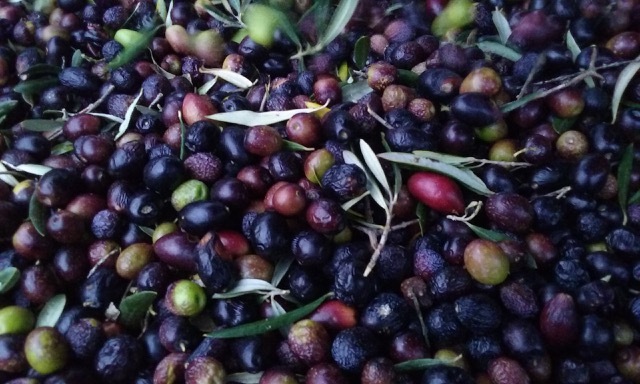 One day we met our neighbour, completely exhausted, telling us that the entire family had worked for days harvesting olives and they still had several hundred kilos to be picked. Always up for a new challenge and never having tried harvesting olives, we volunteered immediately for the late afternoon shift. The grandma, the husband and wife, their daughter, plus the two of us stacked into their car and drove off to the field. On the road there, they explained that olives yield on an average of 20 kilos per tree, though a good tree can give you as much as 60 kilos. 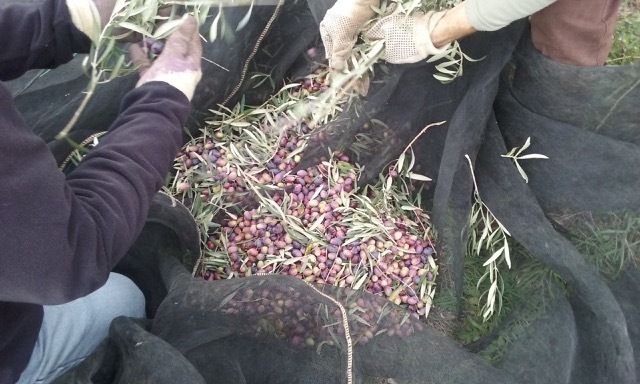 They had already picked 500 kilos, which they had brought to a mill that press your olives into your own oil. This had given them almost 50 liters of organic oil, more than enough for the family for a year. The remaining olives would be brought to a local mill where all olives are mixed, thus not assuring if you get pesticide and other herbicides in your oil. 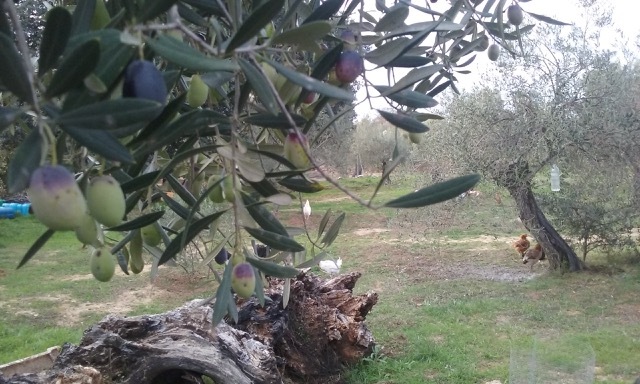 Here one can choose to exchange ones’ crop for their generic oil or wait until the factory’s oil have been sold and get your olives worth in cash some time in the spring. Smaller producers can certainly not get rich by selling their olives this way, but at least the fruit is not wasted. Arriving at their plot, their fifty or so olive trees were planted harmonious within the landscape without the militant order of commercial lots, which look like fine cross-stitching from outer space. Most were at last a century old, wonderfully crocked and yielding a mixture of black and green fruits of at least three different traditional varieties (Thankfully, Monsanto have not been here yet…). Some had grown tall and wild, while others were small and rugged, in between which their chickens would roam, the roaster would rule and their yappy little dogs would run around. The family does not put anything on their olives, other than once a year immersing the fields in water and letting nature do the rest. As far as insecticide, they use a bottle of sugar-water to catch mosquitos that otherwise would attack the fruit – a truly organic crop. We had about a dozen trees to harvest before the sun would set. 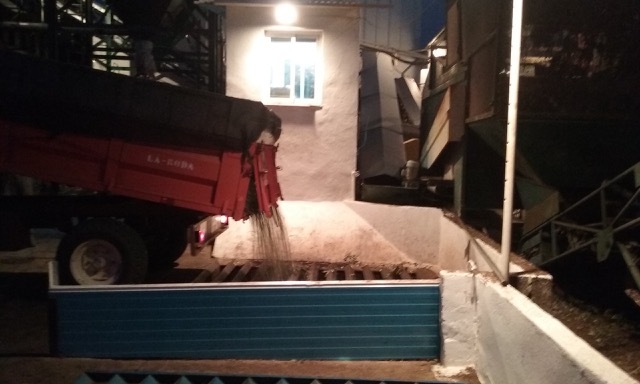 The crop needed to be in the open trailer to be rushed out before 7 pm, when the mill would close its doors. We would spread large nets under each tree, hit the upper branches with wooden sticks, gathering the fruit from the lower branches by hand. 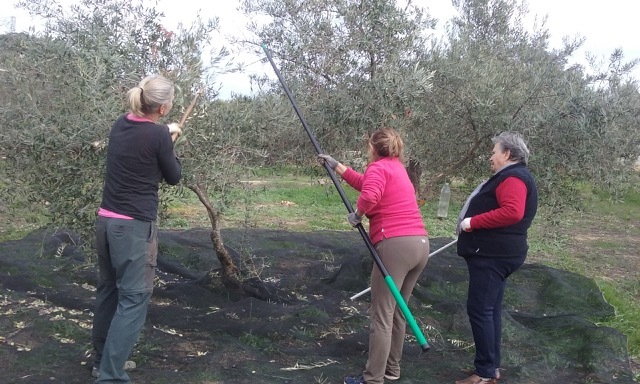 The olives would then fall to the nets below, which were cleared of branches before they were gathered up in buckets and wheelbarrows and emptied into the trailer. Then the process would be repeated again, and again. It may sound romantic, even kind of meditative, reaching for a branch of silvery leaves and shiny black fruit, ready for the picking. And it is sort of romantic, at least for the first few trees, until your back starts aching and your hands have splinters and have been been pelleted by too many falling olives. Night had fallen far to quickly and our troupe was spreading thin, trying to pick clean the last handful of trees. “We got to go!”, called José. The fruit must be brought to the mill the same day or it may be spoilt. So, with wilting strength and a last great group effort, the final fruit was poured into the trailer and off we went. We reached the mill just in time, so this years’ harvest was saved. The following day we reemerged somewhat limping, yet promising our neighbours that they could count on our help next year, as well. A few days before Christmas there was a knock on our door. Our neighbours proudly presented us with a bottle of their very own organic olive oil. After our day as pickers, I will never look upon a bottle of olive oil the same way again. It is a labour of love and, as we have experienced, a backbreaking proposition. 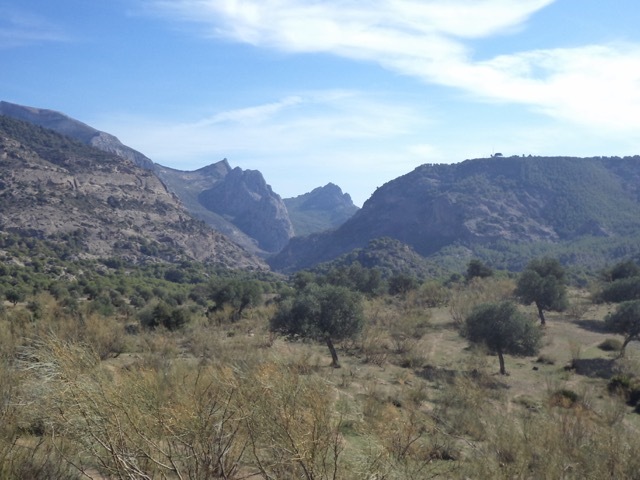 Oil from a lovingly tended and carefully picked olive tree truly deserves the name the Andalucíans have given it – liquid gold.